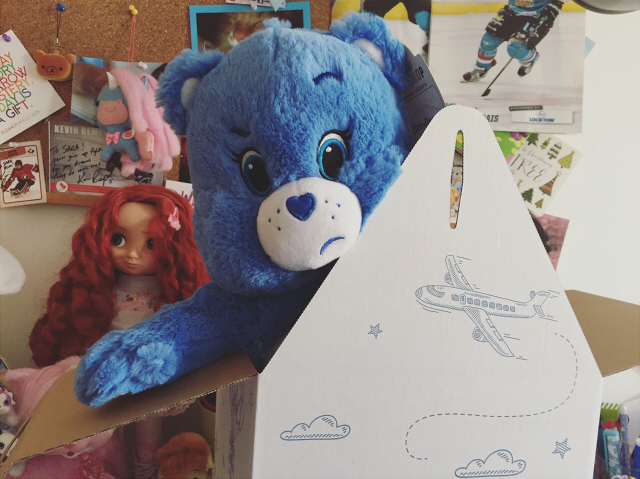 Bloo 'n' Stuff: Toys 'n' Stuff | Latest Build A Bear buys! Welcome to today's Toys 'n' Stuff post. 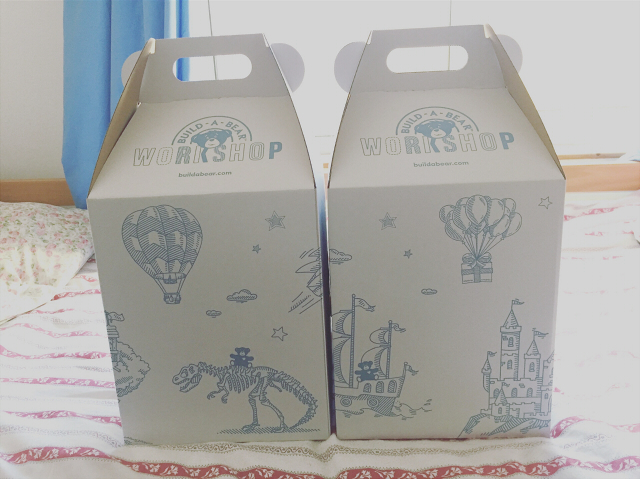 This week I got some cuteness in the mail and I figured I might as well make it an unboxing post. 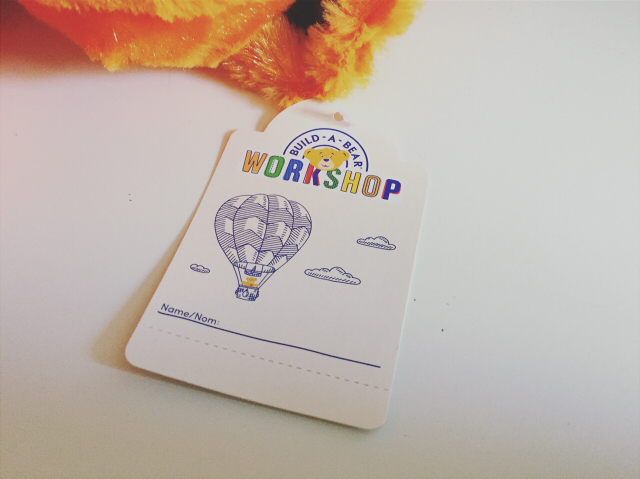 I had been eyeing up one of these cuties for a while but I kept putting off buying him as Build A Bear bears take up quite a bit of space and I don't have much of that right now. He was an online exclusive and I was worried he was going to go out of stock and not come back in so I bit the bullet and bought him. 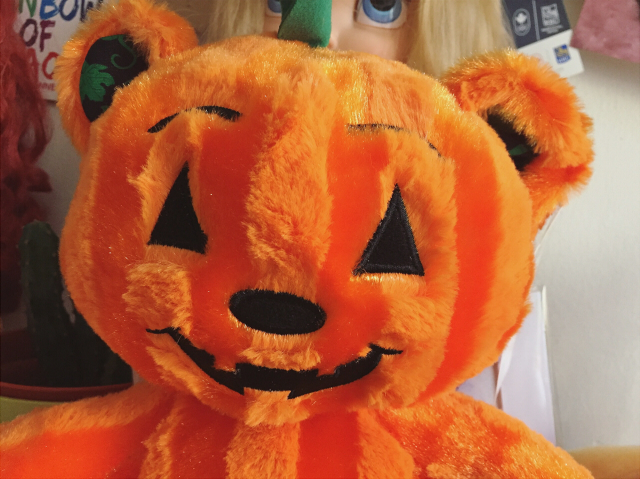 Being me - and despite not having much space - I was content with bordering the one bear I'd been wanting for a long time, I also treated myself to one of their new Halloween cuties. You'll understand why when you see him! Now on with the unboxing. 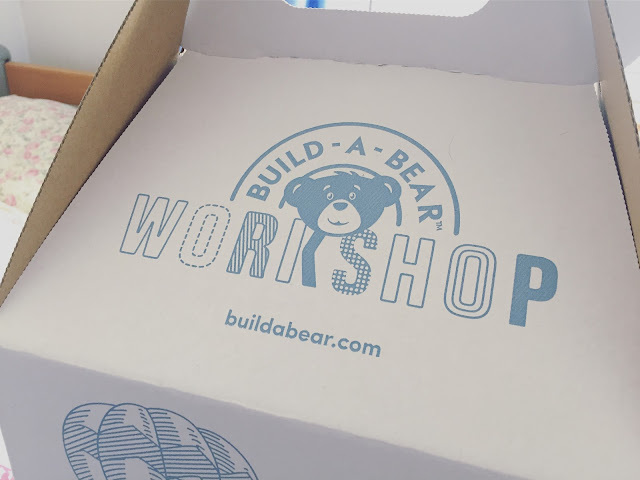 The bears came in their own individual Build A Bear workshop boxes inside a bigger cardboard box. I really do love these B-A-B boxes but I always feel guilty tossing them away, or well recycling them. 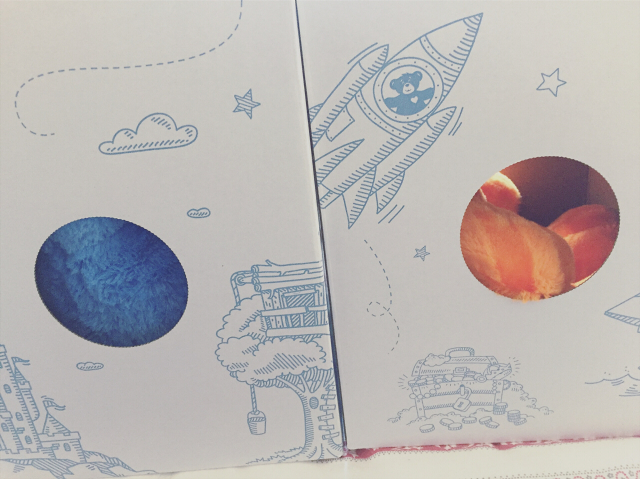 I also love that there's a little sneak peek hole in the box. Can you guess who I got? 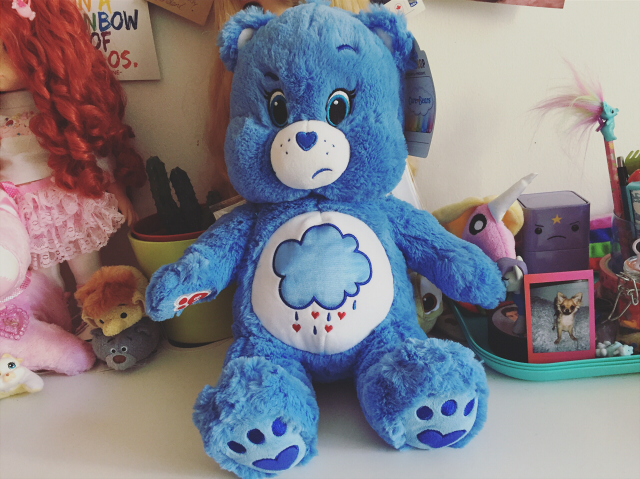 First we have the bear I had wanted for aaaaaaaages, Grumpy Bear! 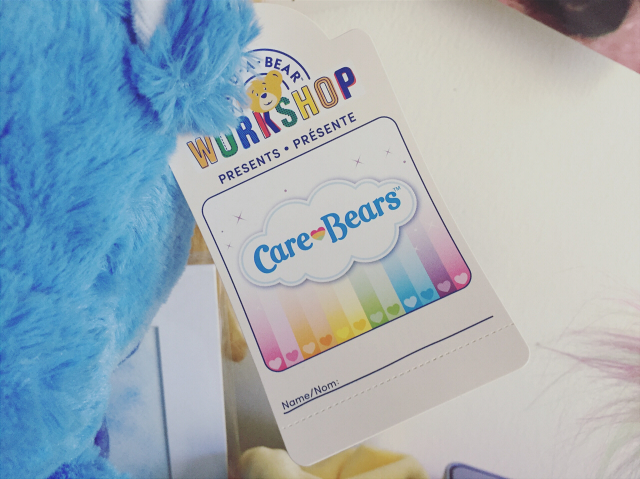 One of my favourite videos growing up was The Care Bears Adventure in Wonderland and Grumpy Bear was my favourite. I loved that he was blue and I also loved his song about pickled beets, not to mention the fact he was grumpy and made no apologies about it. I don't know why that spoke to me as a kid but it still does as an adult. 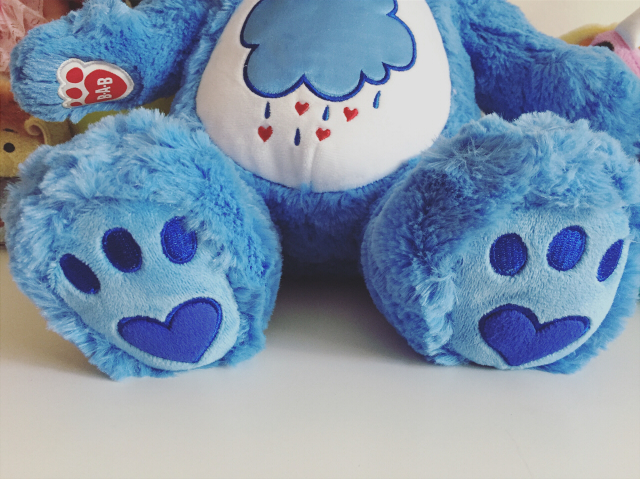 How cute are those little blue paws? I don't know why they make me want to squee and cuddle them so much! 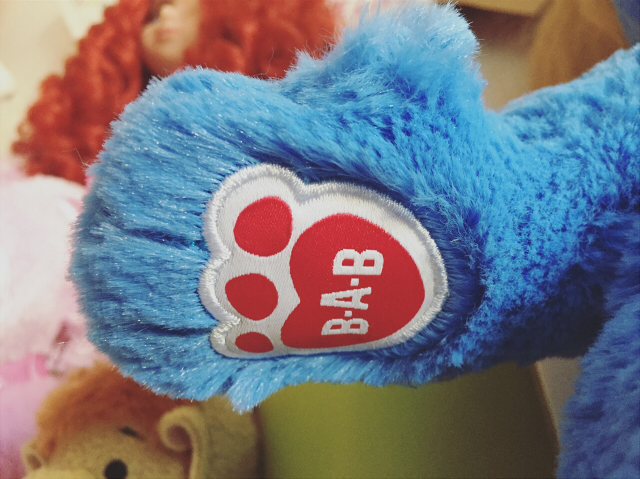 I think the Care Bear line in B-A-B are probably one of my favourites they've ever had. 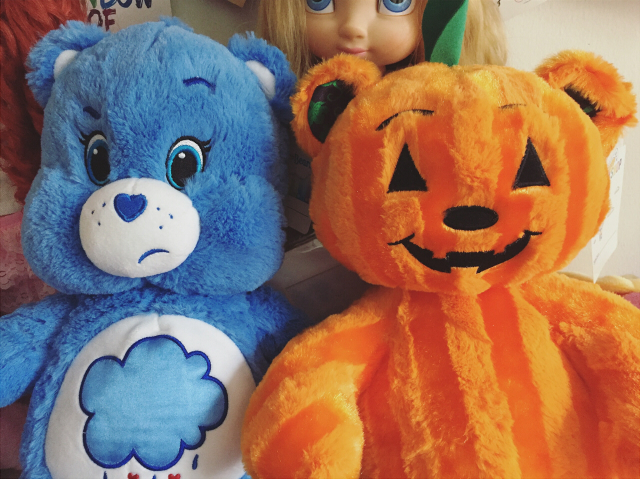 There's been times I've felt a little let down by the cuteness - to my personal taste - of the bears but I really can't fault the Care Bears. They stand up in both cuteness and quality. 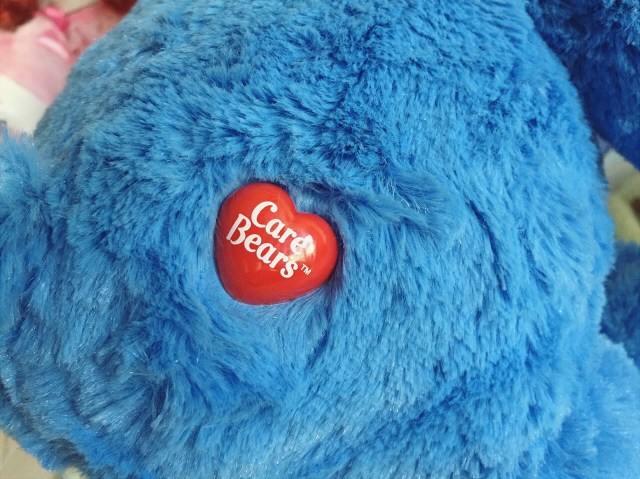 I love that they come complete with their adorable tushie Care Bears button. 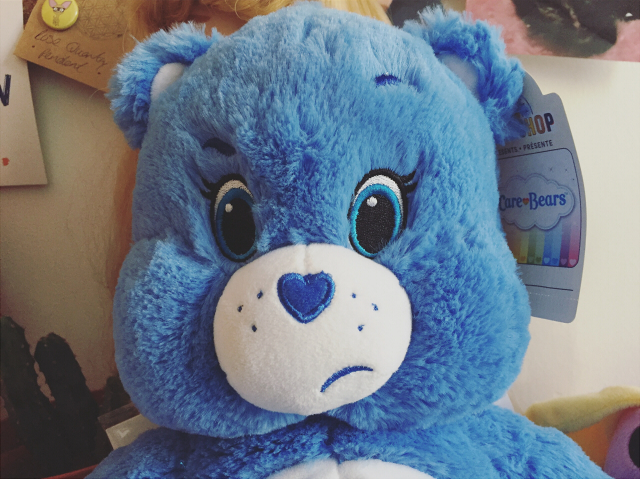 I didn't buy Grumpy Bear any clothes, much like I didn't buy any Tenderheart Bear any either. They would only cover their cute belly badges anyway. 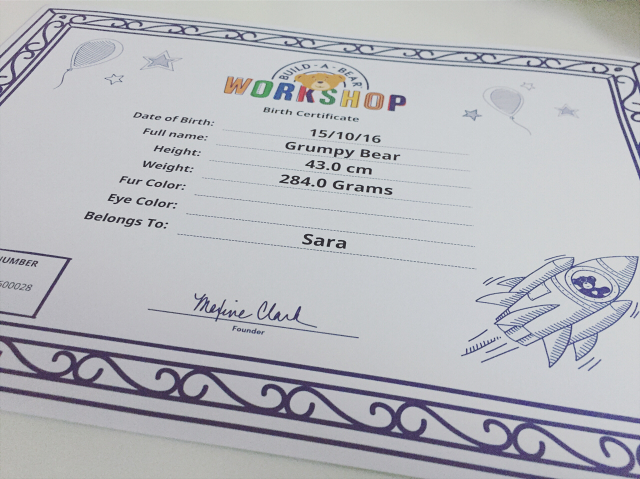 Finally, Grumpy Bear came with his birth certificate. I don't know why it didn't auto put in his eye colour or fur colour. Oh well. Next we have my spur of the moment buy. I might make this a Halloween tradition, since I don't really have any of those. 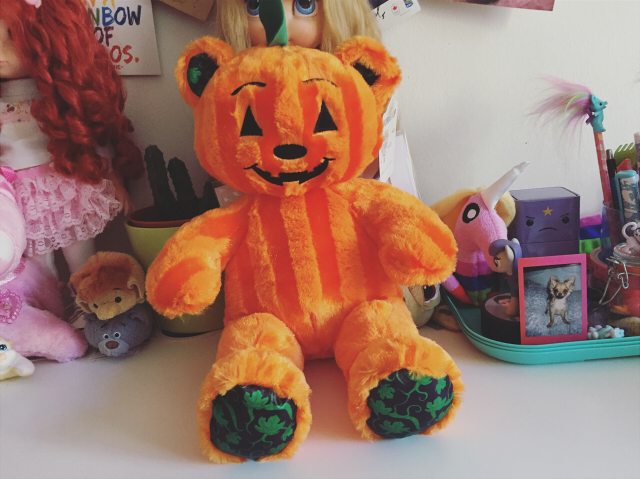 Last year I got my werewolf from their Halloween range and this year I couldn't resist this cutie. 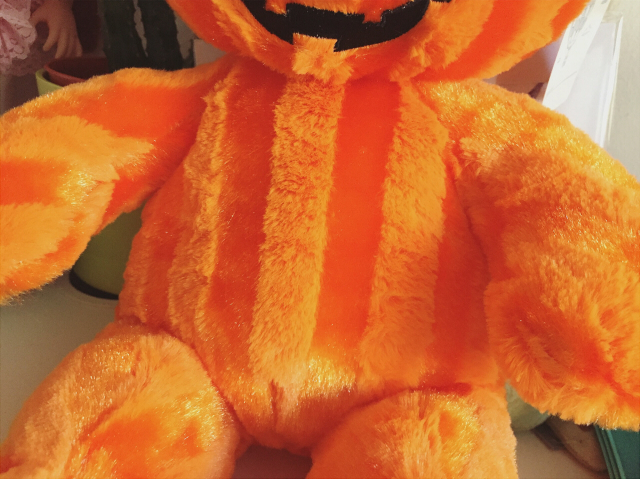 How adorable is this pumpkin bear?! I just thought he was so unique. 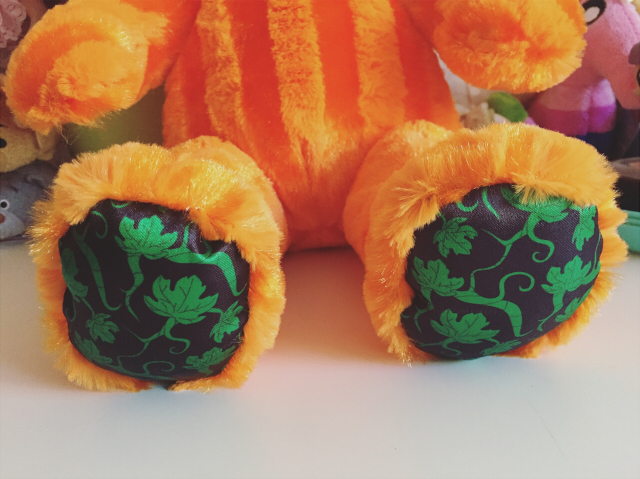 I love how he has two kinds of fur to make up the lines on his body to give him more of a pumpkin look and the green and black detailing on his paws and ears too. 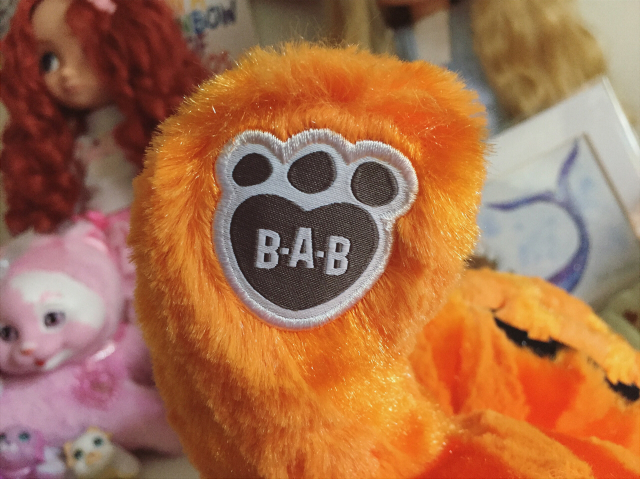 This dude came with his B-A-B patch on his hand and his regular B-A-B ear tag. I love how his patch is black. 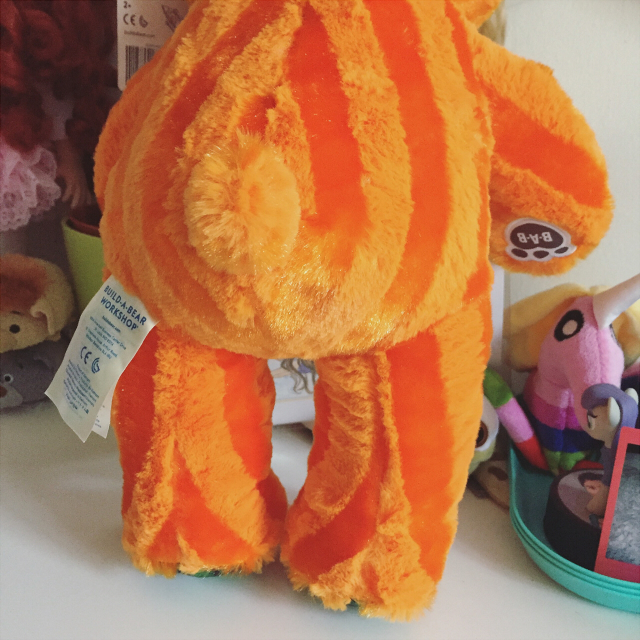 It really stands out on his orange fur. 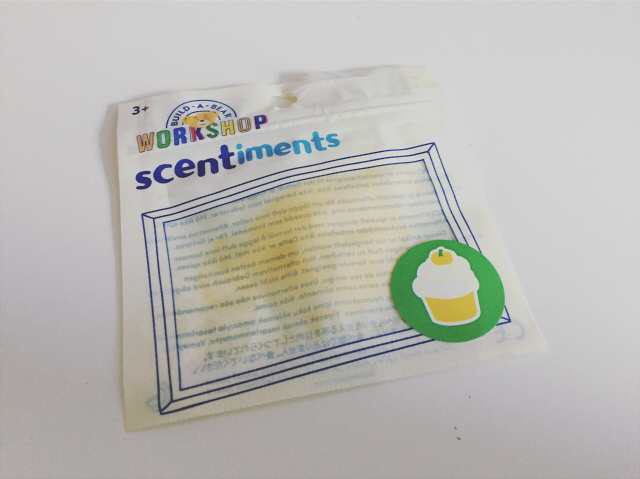 For his scent I got pumpkin spice. 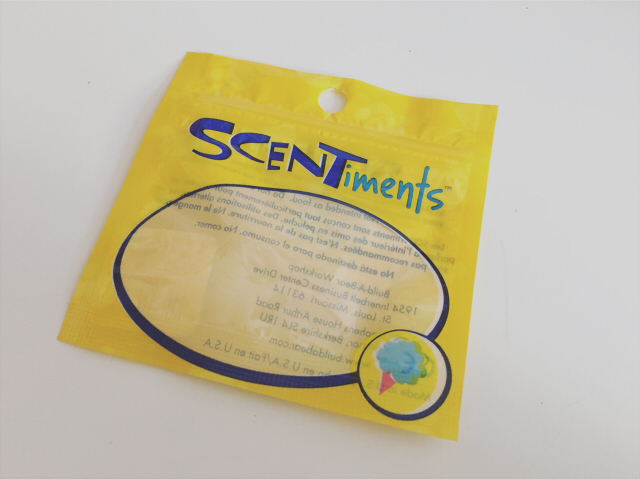 I'm not a big fan of pumpkin spice lattes and such but I figured it was pretty apt for this guy and it's different than the cotton candy, strawberry or bubble gum scents I always get. 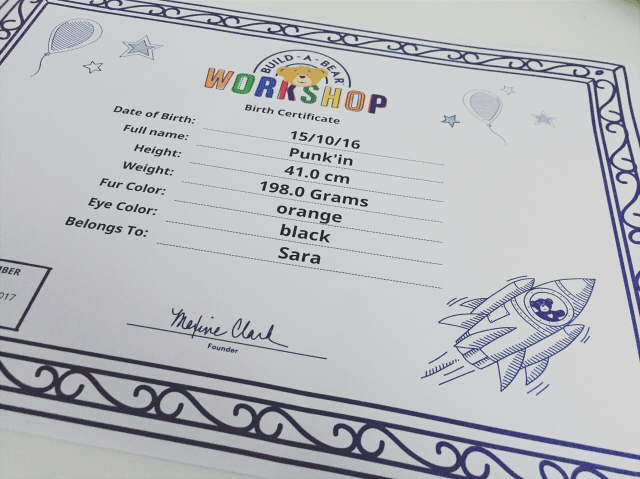 Finally, his birth certificate. 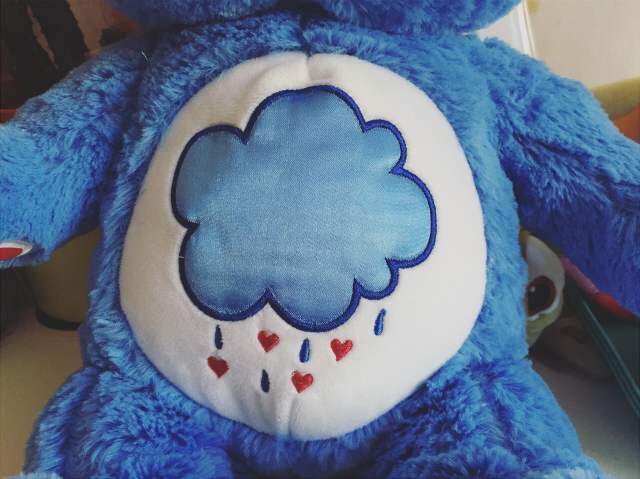 I had to come up with a name for him, unlike Grumpy Bear. I think it's pretty adorable, if I do say so myself. There's a little bit of a size difference between Grumpy Bear and Punk'in and Punk'in is considerably lighter and thinner. The photo below really doesn't do the difference justice though. If anything Punk'in looks a bit bigger but that's because it was difficult to get them so sit beside each other and he's a tiny bit closer to the camera. 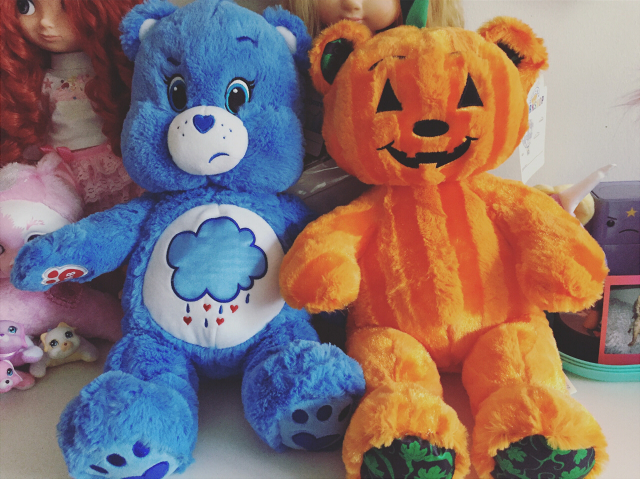 I also love how Punk'in looks so happy and Grumpy Bear looks... well, grumpy. What conflicting characters! These dudes are just the coolest and I'm glad I finally got around to getting Grumpy Bear and impulse bought Punk'in. There was a Mummy bear that I was tempted to buy too but I figured that would be pushing it a little bit. I'm thinking I might do a future post about my whole collection, so look out for that if you're interested in these kinds of posts!